Through 27 game weeks I have been sorely disappointed in my overall performance as an EPL fantasy manager. Much like fantasy (NFL) football, which I have participated in for 36 years, luck always plays a factor. This season luck has not been on my side, struggling through most weeks as I continue to look to turn my season around with just 11 weeks remaining. Initially I cited a single point during the season, which I transferred out Alexis Sanchez and felt as if that move cost me the season. After looking at the data and presenting it in the Sanchez Effect, last week, Sanchez has only earned an addition 59 points through 27 weeks an average of just 2.1 points/week. Not really what I expected. figuring the total would have been greater, I looked elsewhere to bottom line why my squad is doing poorly. 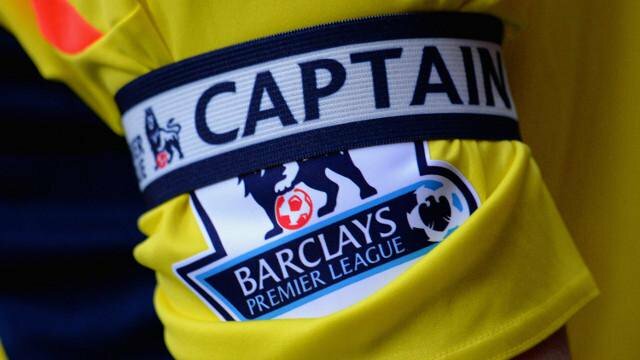 This week I turn my attention towards the captain’s armband, which is given to a player each week and doubles their point total. This decision has led to many average weeks being turned into great weeks. But how have I fared over 27 game weeks? 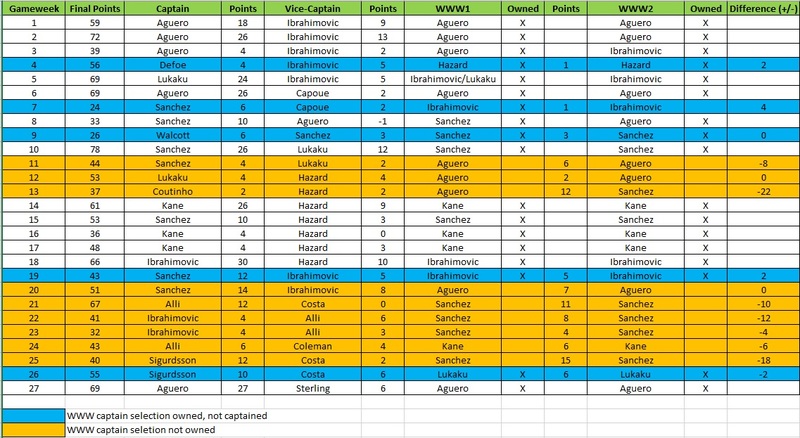 Let’s check the numbers against who was selected as captain and vice-captain and who were the recommended captain choices based on a poll totals from two different fantasy football sites I frequent. When the numbers are viewed in a spreadsheet format the results provide a telling story that doesn’t really favor my decision on who to give the armband to. In 13 out of 27 weeks (48.1%) I owned and started the player who was recommend in website captain polls (WWW1 & WWW2). There were 5 weeks (18.5%) I owned the player selected in the website polls but selected a different player to captain. In just 9 weeks (33.3%) I didn’t own the poll captain selection with 6 of those weeks taking place since GW20. In those 9 weeks if I would have owned the poll selected captain I would have scored an additional 80 points. It doesn’t come as a surprise that Alexis Sanchez accounted for 44 points. Sergio Aguero accounted for 30 points, while Harry Kane just 6 points. What this doesn’t take into account are players who had good weeks but weren’t tapped as the top poll captain selection or one of the Dream Team players for the week. I believe what this chart tells me is that along with having poor luck this season, my decision making has been terrible. I look back on the season and ask myself, “Why did I start <insert player>?” Reading through my weekly Premier League Retrospect articles provides an insight I didn’t have last year. Some of the decisions were based on budget, while others were based on form and fixtures of players selected. This doesn’t come as a surprise but unlike last year I have not been able to establish any sort of consistency or even put together a 5-7 week run of green arrows. GW4 through GW6 has been the best run I’ve had all season, returns of 56, 69 and 69. GW2 and GW7 are the only times my final score exceeded 70 points with 72 and 78 respectively. It’s just been a difficult year. The last finger I can point before point it towards me would be examining defensive units, as we recall a clean sheet was hard to come by early in the season, which cost many manger points.